Tamarind is an evergreen tree; it grows up to 80 feet high; its trunk, covered with shaggy, brownish-gray bark, may reach 25 feet in diameter. 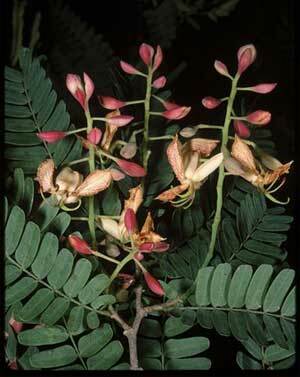 The alternate, even-pinnate leaves have from 2- to 40 small, opposite, oblong leaflets. The pale yellow flowers have petals with red veins and grow in racemes at the ends of the branches. Flowering time in the northern hemisphere is during April and May. The fruit is a cinnamon-colored oblong pod, from 3 to 8 inches long, with a thin, brittle shell enclosing a soft, brownish, acidulous pulp. 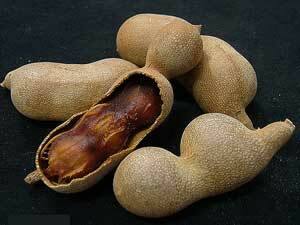 Tamarind is a tropical tree of India bearing pods with a sweetish sour soft brown pulp. This pulp contains considerable proportion of tartaric acid and invert sugar. In the Orient a brine is made of the pulp for pickling fish, and an acid jelly made to serve with fish and cold meats. Rice cooked with Tamarind pulp is also eaten with fish or meats. The fruit is a mild laxative. In the tropics, it is commonly eaten as a food and made into cooling beverages. It makes a refreshing drink for those ill with a fever. The natives of the tropics use the leaves externally in a form of poultice or fomentation. A small amount of the pulp of the fruit, mixed with Cassia fistula and the powder of Rhubarb is a refreshing drink and an appetite stimulant. 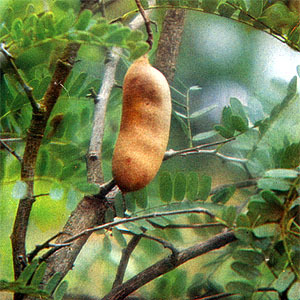 As a laxative, Tamarind pulp is usually used with Senna to modify the action of the latter. Tamarind Whey: mix 1 oz. pulp of the fruit with 1 pint of milk, strain it and add a little sugar to the whey. Tamarind Beverage: boil 3 pints of water with a teacup of tamarinds, a few currants and raisins until it has evaporated 1/3. Strain and cool. Tamarind Marmalade: 1 qt. shelled tamarind nuts, water, sugar. Boil tamarinds in plenty of water until soft. Put through sieve to remove seeds and fibers. Measure equal parts of sugar and pulp and simmer slowly, stirring constantly until the mixture thickens enough to coat a silver spoon. Pour into sterilized jelly glasses and seal with wax.